Welcome to Saint Dominic’s Parish Church for our Sunday Holy Mass service. 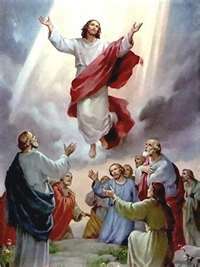 We celebrate this Sunday the Ascension of the Lord. Christ, the Risen Lord, had completed His saving mission and went up to heaven from where He came down. The Lord would not abandon His disciples but send the Holy Spirit to guide them into the way of eternal life. More importantly, He promised to come back one day. The Ascension is, therefore, the celebration of Christian hope for humanity. We pray to the Lord for the blessing of faithful service of God and of neighbor while waiting for His second coming in glory. The Ascension of the Lord is the closing of Christ’s physical presence in the world and, at the same time, the beginning of His powerful working through the Church’s mission in the world. The way Christians live their faith and share their love with others is proof that they are truly united with God the Father, the Son and the Holy Spirit, and with one another.